Panda invites Monkey along on his special journey up into the mountains. Monkey is excited to find out what the surprise is and wants to rush. He keeps telling Panda to go faster. Panda takes his time, he wants to share things along the way with Monkey but Monkey keeps rushing on ahead. Then they come to the river and Monkey finds he needs his friend very much if he is going to finish the journey and see Panda’s surprise. This is a beautiful story of difference and friendship. It also touches on the ideas of slowing down and being patient so you don’t miss things. 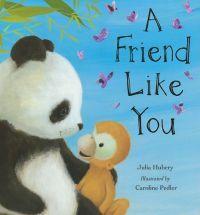 This is quite a lot of text for a picture book and for me the way it is written makes you want to take your time and plod along with Panda, enjoying the journey. That by no means should make you think this is a slow or boring book. The glorious illustrations are full of space and detail that add to the atmosphere of peaceful enjoyment. A truly wonderful picture book.